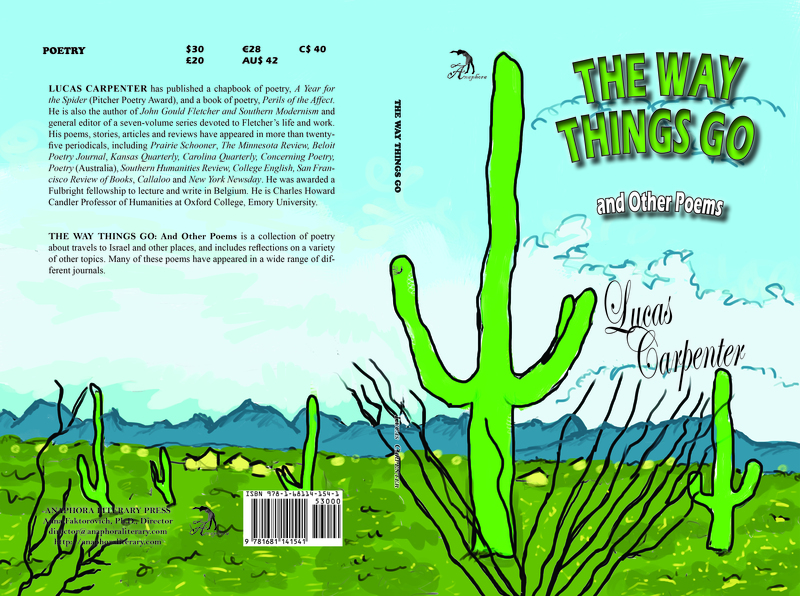 The Way Things Go: And Other Poems ($15 – Click to Purchase, ISBN: 978-1-937536-42-8, Hardcover ISBN: 978-1-68114-154-1, LCCN: 2013904200, 6X9″, 80pp): is a collection of poetry about travels to Israel and other places, and includes reflections on a variety of other topics. Many of these poems have appeared in a wide variety of different journals. ***Mind and Body: And Other Stories has been nominated for the 53rd Georgia Author of the Year Award (GAYA) in the Short Story category. 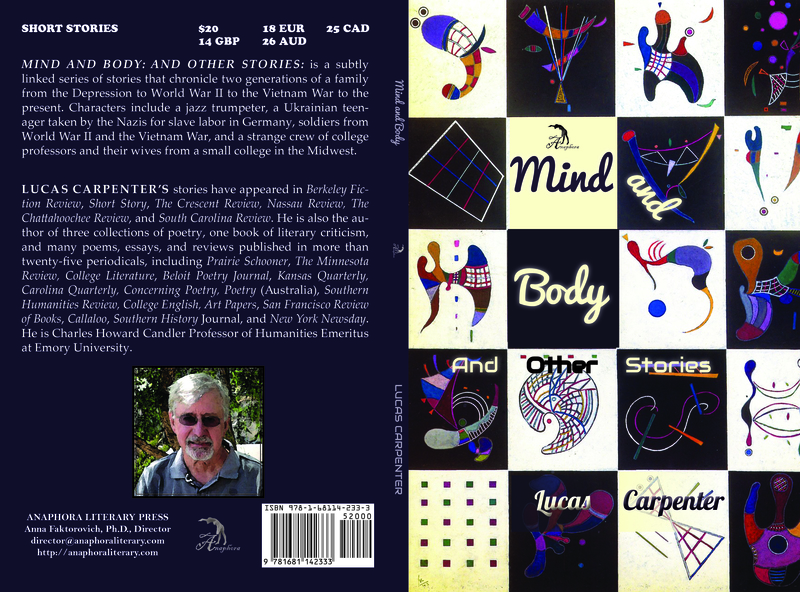 Mind and Body: And Other Stories: ($20, 126pp, 6X9”, Paperback ISBN-13: 978-1-68114-233-3, $35: Hardback ISBN-13: 978-1-68114-242-5, $2.99: EBSCO EBook: ISBN: 978-1-68114-257-9, LCCN: 2016901955, April 2016; Purchase on Amazon, Google Books, or Barnes & Noble): is a subtly linked series of stories that chronicle two generations of a family from the Depression to World War II to the Vietnam War to the present. Characters include a jazz trumpeter, a Ukrainian teenager taken by the Nazis for slave labor in Germany, soldiers from World War II and the Vietnam War, and a strange crew of college professors and their wives from a small college in the Midwest. Lucas Carpenter was born in Elberton, Georgia. He was educated at the College of Charleston (B.S. ), the University of North Carolina at Chapel Hill (M.A. ), and the State University of New York at Stony Brook (Ph.D.). He is the author of John Gould Fletcher and Southern Modernism (U. of Arkansas Press, 1990) and general editor of a seven-volume series devoted to Fletcher’s work. He has also written a chapbook of poetry, A Year for the Spider (UNC Pitcher Poetry Award, 1973), and a book of poetry, Perils of the Affect (Mellen Press, 2002). His poems, stories, articles and reviews have appeared in thirty-seven periodicals, including Prairie Schooner, The Minnesota Review, Beloit Poetry Journal, College Literature, Kansas Quarterly, Carolina Quarterly, Concerning Poetry, Poetry (Australia), Southern Humanities Review, College English, San Francisco Review of Books, Callaloo, Chronicle of Higher Education, and New York Newsday. He was awarded a Fulbright fellowship to lecture and write in Belgium during the 1999-2000 academic year. He is Charles Howard Candler Professor of English at Oxford College, Emory University.